INDIANAPOLIS – Firefighters had an inside look at how work is progressing in the expansion of the Franciscan St. Francis Health Indianapolis campus on the city’s south side. 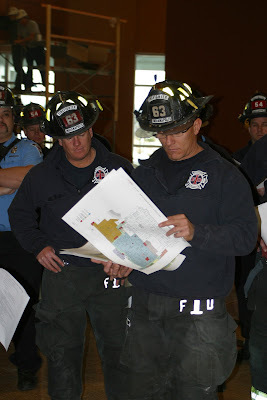 Indianapolis Fire Department members from Perry and Franklin townships visited the facility Jan. 26 with hospital officials and project managers, getting a basement-to-roof look at areas nearing completion and those where construction remains under way. "This tour gave firefighters an opportunity to become familiar with new areas of the hospital and to familiarize them with the fire alarm system and critical access points," said St. Francis Security Director Michael Johnson. One of their stops took the fire crew up six flights of steps to the roof of the patient tower, one of the tallest vantage points in southern Marion and Johnson counties. Meanwhile, St. Francis officials report that Phase I services are slated for opening April 13. These services are located in the basement and first two levels. Visitors will find some significant changes. The main entrance and lobby (Level I), currently located on the west side of the campus (Emerson Avenue) will be relocated to the east side of the campus, facing Interstate 65. An expanded Emergency Department and its entrance are north and adjacent to the main entrance. When fully occupied, the emergency department will have 55 exam rooms and four trauma areas, all organized into special pods. Each pod will be used to group patients with similar diagnoses or needs – a design innovation that enhances efficiency, safety and communication between clinicians in caring for patients. Work on the $265 million project, which began in late 2007, is moving at a vigorous pace, particularly in the patient bed tower (Phase II). St. Francis officials say this final phase of construction will end in late spring 2012. The tower will add 221 inpatient beds to the facility’s existing 230 beds. "At that time we will phase out inpatient services at our Beech Grove hospital," said Keith Jewell, senior vice president and chief operating officer. While inpatient services at Beech Grove will have moved to the 8111 S. Emerson campus with the completion of Phase II, some St. Francis outpatient services are expected to remain in Beech Grove. The hospital has been working close with Beech Grove officials and leaders about the potential re-use of the campus facilities since St. Francis announced its Indianapolis project in early 2007.